Our gnome figurines are bursting with color and personality, ready to add a creative spark to any outdoor space around your home. 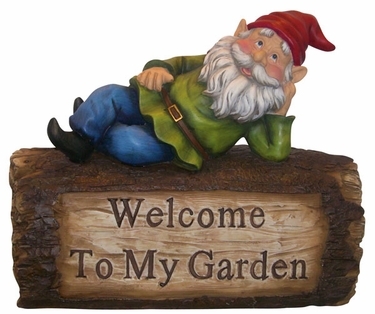 Our Welcome Gnome invites your friends and family into your private garden with the large easy to read "Welcome to My Garden" message on a sign that looks like a rustic block of wood. This particular gnome garden welcome sign features a gnome with a friendly and curious expression and is sure to become a fun fixture at your household, and one that guests will love to see each time they stop by. In addition, these welcome garden gnomes are all made of cast resin to make sure they are appropriately long lasting and weather-resistant. If you're wondering where to buy garden gnomes, the answer is "right here" at GardenFun.com!